For Rockhampton electricians you can rely on, look no further than our qualified team at J.A.F. Electrical Solutions. Our team of local electricians are dedicated to providing the highest quality of electrical services for our valued clients throughout Rockhampton and the surrounding areas. For commercial and domestic electrical installations, repairs and maintenance, category 6 data cabling, C-Bus home automation and air-conditioning sales and installation, our Rockhampton electricians are here to provide an unbeatable level of quality. We are fully focused on providing the prompt, professional service you need at a price that won’t break the bank. At J.A.F. Electrical Solutions, our client’s needs are always our number on priority. 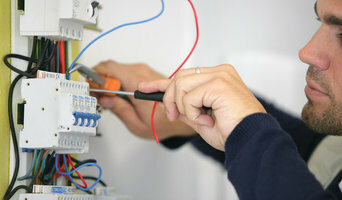 For the electrical solutions you can count on, give our skilled team a call today. We’re waiting to hear from you! We specialise in all residential/commercial electrical services. Serving Rockhampton, Norman Gardens & surrounding suburbs. Elektriker in Rockhampton, QLD, AU finden bei Houzz: Suchen Sie auf der Seite mit allen Experten gezielt Elektroinstallateure und Elektrofachbetriebe in Rockhampton, QLD, AU. Durchstöbern Sie die verschiedenen Firmenprofile – die Bewertungen und Erfahrungen anderer Kunden helfen Ihnen, den passenden Elektriker zu finden. Kontaktieren Sie dann Ihren Wunsch-Handwerker, um weitere Infos zu erhalten.